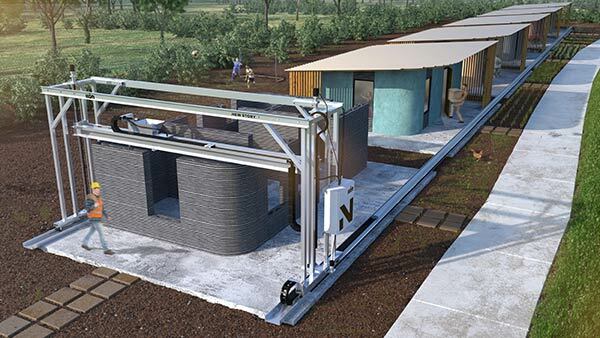 New Story, a U.S. non-profit providing safe homes for people living in extreme poverty in developing countries, has teamed up with Icon, a construction technology company, to develop a 3D printer that can quickly build simple, quality houses for just US$4000. 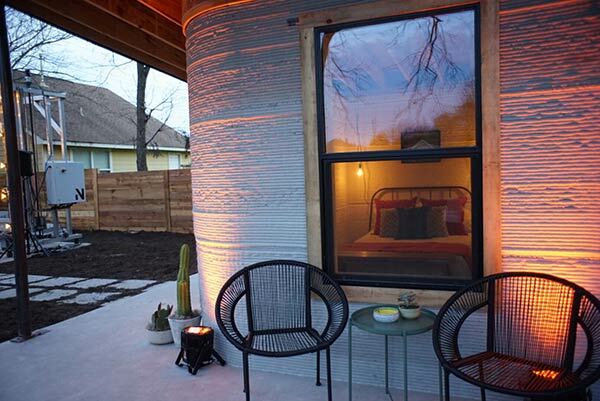 The new 3D printer for house construction, named Vulcan, was revealed last month at the South by Southwest festival (SXSW) in Austin, together with the team’s first 3D Printed house. This first display home was built for US$10,000, and took only about 48 hours to build, with the printer apparently not running at full speed. New Story has previously built conventional low-cost housing, in Haiti following the 2010 earthquake, and in El Salvador. In doing so, they discovered that even when using highly efficient building practices, the overwhelming need for new dwellings could not be met with traditional construction techniques. Consequently, the New Story team started researching new ways to build more affordable, quality homes in a faster and more efficient way. The conventional homes the non-profit was building, which had concrete walls and very simple designs, were already quite inexpensive by American standards, at about US$6,500 each. However, they set a goal of eventually making homes significantly cheaper, as well as making the construction process quicker, and improving the overall quality of the home. 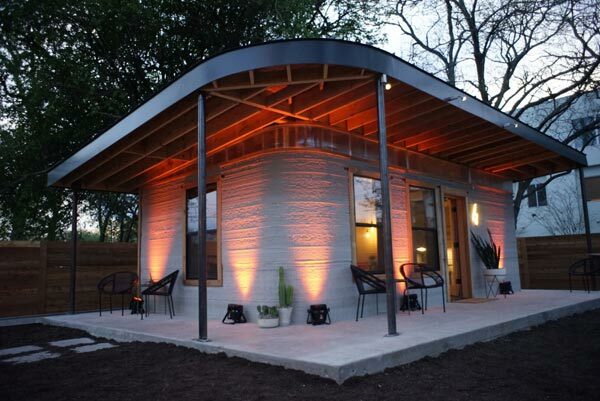 Months of research led them to the possibility of building 3D printed homes. 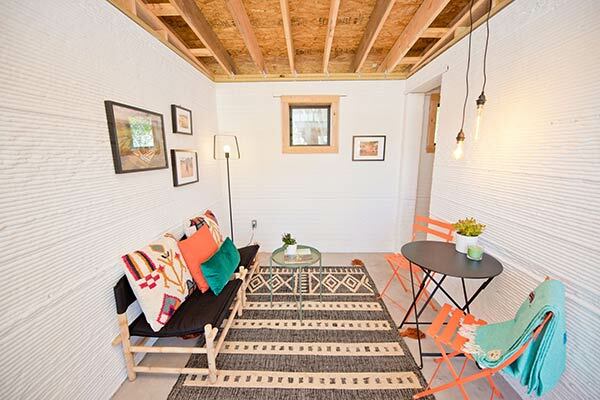 While New Story’s previous homes usually took between 13 to 20 days to complete, they discovered that 3D printing similar sized homes could potentially take only 12-24 hours to build, and become significantly cheaper overall. The new Vulcan 3D construction printer is able to slide along tracks, squirting out concrete material in layers to build up the floors and walls, guided by its software containing each house design. Because the printer moves on tracks, although the width is limited, the print area is theoretically unlimited lengthways. The printer works in a similar way to smaller 3D printers to construct objects. Unlike conventional building methods where one wall goes up at a time, one thin layer of liquid concrete is placed down at a time, hardening as it goes, and growing the building from the ground up. 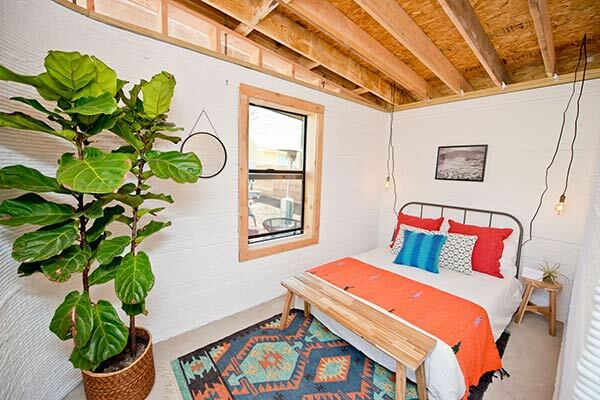 The first display home is in an Austin, Texas backyard, and includes two bedrooms, a bathroom, and a kitchen. The roof (extending out to make a porch roof) and the concrete foundation platform are not 3D printed. This test home will be used as office space for Icon, so the company can spend time assessing the space and tweaking the initial design. The 3D printing software will allow for many different designs. Although the test home is permitted to current U.S. building standards, the team will also be testing the home for earthquake safety, which will be a factor in many regions of the world where this kind of home could be constructed. The homes will be built to the International Building Code (IBC) structural code standard. There are other companies and organisations working on 3D printing homes – I will write about some of these in later posts on 3D building construction – but rather than targeting wealthier people in developed nations, New Story is specifically aiming to help people living in some of the most impoverished parts of the world. The big non-profit idea here is to make this technology affordable to “the bottom billion” rather than just the top few billion. With this in mind, the 3D printer is designed to be able to be transported by truck, in harsh conditions, to rural areas. 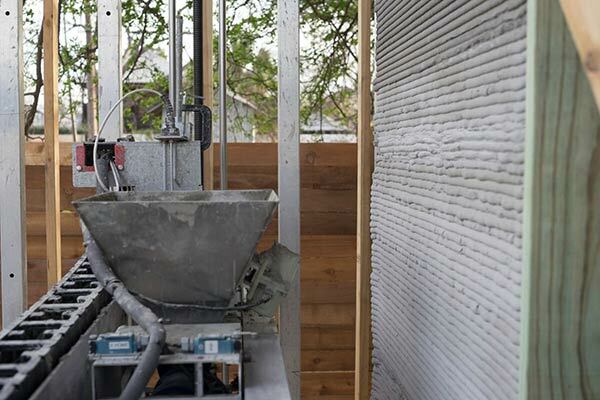 The mortar used in the printer must be able to be sourced locally, and the concrete foundations for each home will be the same as previously used by New Story for affordable housing in Haiti and El Salvador. In case you were wondering, yes the new 3D construction process is far less labour intensive than conventional construction methods, with each home able to be constructed with the help of only 2-4 workers. This creates something of a dilemma for New Story, and indeed anyone else setting up for 3D printing construction in the future, as the non-profit has previously used building as a way to provide local jobs as well as shelter. However, the encouraging proposition that they could double or even triple the number of homes built, at a much lower cost, overrode the drop in the number of jobs supplied. In addition, the type of jobs needed will be new kinds of technical jobs, which they believe will better position workers for the future. New Story is planning to take the printer to El Salvador later this year to print some test homes, and then to complete a whole community of homes. If all goes well, the plan after that is to spread the technology globally to areas in need. New Story is now in the process of raising US$600,000 for the first-ever community of 3D printed homes in El Salvador. Crowdfunded donors are being sought to fund whole houses for US$4,000. Because it is a non-profit, New Story wants to share the technology with other non-profits and governments, to be able to change the lives of the most people possible. Crucially, it plans to eventually make the printer available for less than US$100,000, with a single printer able to construct at least 1,000 homes. This all sounds very promising in terms of being part of a solution to global housing shortages, especially in poverty-stricken regions, and it is. However, it has been pointed out that the biggest need for safe, affordable housing in the developing world in not in rural areas with a lot of space for building, but in large and heavily populated cities. Although simple and relatively small, these particular 3D printed houses do still take up quite a bit of land area, and space is often very limited in areas of high population density. 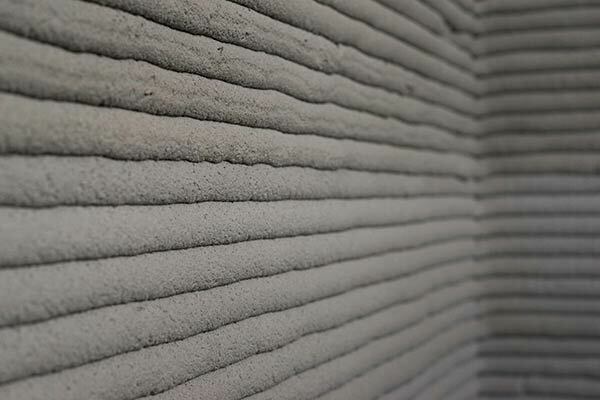 To be globally scalable, affordable 3D printed construction may well have to be able to scale vertically as well as horizontally.